Melissa Davis Blue, BBA ’01 University of Texas at Austin and Melissa Watson Mehall, BBA ’01 University of Texas at Austin and J.D. 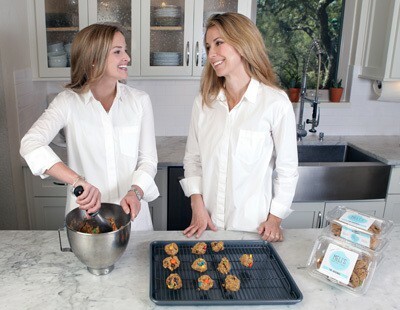 2005, Southern Methodist University, co-founders of Meli’s Monster Cookies, have found a recipe for success in the retail world with their gluten-free cookie brand. 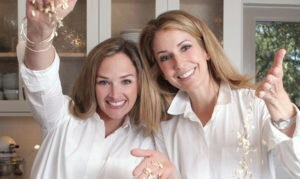 The two are lifelong friends that saw a need in the marketplace and had the perfect product to launch. Meli’s are sold in the frozen food section of approximately 350 retail stores throughout Texas, including Walmart, HEB, Central Market, United Grocery Stores, Albertsons, Royal Blue Grocery, Market Street, The Sunflower Shoppe and Roy Pope Grocery. Meli’s currently offers three flavors: Original, Chocolot, and Cashewlicious, and is expanding into a dry-line of baked items and individually wrapped cookies this year. After their partnership was formed (Bluehall Bakery, L.L.C. ), Blue, who lives in Austin, and Mehall, who lives in Fort Worth, set out to market the product. “We were literally dropping off the cookies at local grocers acting as our own distributor, making follow-up calls and meeting half-way between Austin and DFW to pick up cookies,” Mehall said. While now four (4) years later, Meli’s has a national distributor, numerous consultants and its sights on taking the product nationwide. Blue and Mehall, both busy moms always searching for healthy and filling after-school snack options, added that Meli’s are in a sense, “a smarter cookie.” In addition to the gluten-free benefits, the nutritional benefits offered by this preservative free cookie, including protein and fiber, make the cookies a quick and convenient, healthy homemade indulgence. The “Mellissa’s” are hopeful for the future of Meli’s and are thankful for the strong business foundation that they received at the University of Texas McCombs School of Business that has aided in their success.